Sports Costs > How Much Does Parasailing Cost? Parasailing, like paragliding, is a recreational activity where a person is towed behind a vehicle, usually is a speedboat, while they are attached to a parasail or a specially designed parachute. Like flying a kite with a fishing pole, parasailing will use a hydraulic winch that slowly reels you from the flight deck into the air, up to 1,200 feet. As the ride ends, you will slowly be reeled back to the deck. On average, parasailing can cost anywhere from $25 to as much as $150 per person. The session on average lasts anywhere from 8 to 15 minutes and some can take up to three people at a time. For example, PerdidokeyParasail.net offers parasailing for one to three people parasailing at the same time. They can be taken anywhere from 400 feet to 800 feet, and the prices range anywhere from $50 to $190. ParasailDestin.com, a company located in Destin, Florida, offers rides for $25 to $60. Customers can go up to 800 feet and up to three people at a time. We looked up parasailing companies in some of the world’s most touristy areas. Listed in our table below are what some companies charged in that area. Ft. Myers Beach, FL $50 to $90 per person, depending on length. Panama City Beach< FL $50, $70 and $80 for up to four miles. For those who don’t want to go up in the air but would rather watch from the boat, there may be a small $5 to $20 fee. 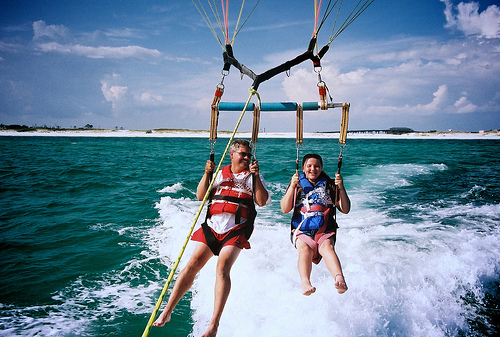 Some parasailing companies can take up to 50 pictures for an additional fee, usually around $20 to $40. The same can be said about high definition videos, which can be a bit more, seeing a dedicated person will have to film the entire time. Combining the two can often lead to a discount. When you’re set to parasail, most will launch you around 500 to 800 feet above the water and will commonly travel about four miles. Depending on the options, some will allow you to touch your feet on the water while parasailing and can handle up to six people at once. The time is going to greatly vary depending on the company policy, but most rides will be 30 to 45 minutes long. Make sure the company you’re signing up with is certified by the US Coast Guard and are insured as well. Ask the company how long they have been parasailing, particularly the captain. When parasailing, companies will ask you either bring a bathing suit during the warmer months or something a bit warmer during the colder seasons. Regardless of what you wear, always make sure it’s loose and comfortable. It also doesn’t hurt to bring a pair of sunglasses and sunscreen. Be sure to know the weight requirements before paying online. Most companies will ask you weigh at least 130 pounds and no more than 330 to 350 pounds. Try to find friends that will join you in the activity. Most, if not all companies, that provide this activity offer discounts for groups. In touristy areas, check for coupons and offers to see who is offering the best deal in town. It also doesn’t hurt to look on daily deal websites such as Living Social or Groupon. If you find a company that you like, go to their official website or Facebook page to see if they have any active promotions.